A skeevey curmudgeon is given an opportunity to change his vile ways when he is visited by four ghosts on Christmas Eve: the spirit of his former business partner Jacob Marley, the Ghost of Christmas Past, the Ghost of Christmas Present and the Ghost of Christmas future. 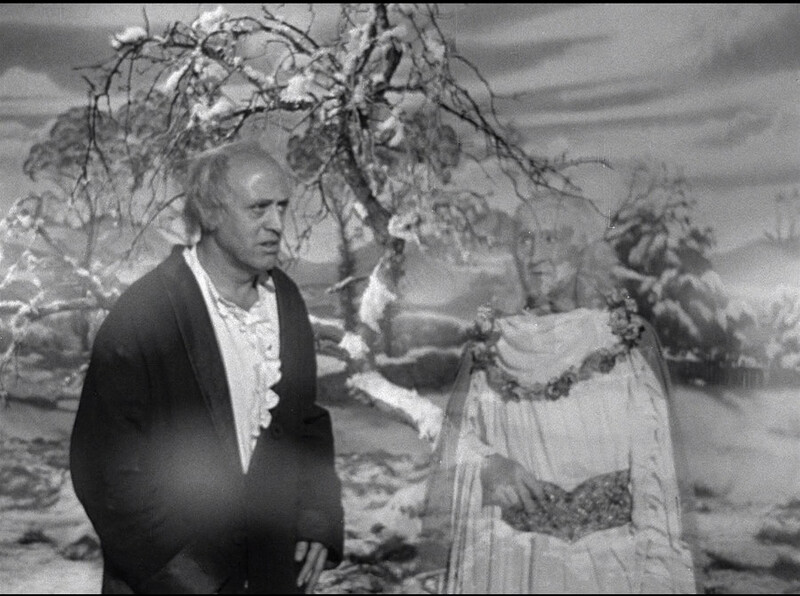 This past Christmas I was asked to bring a copy of “that Christmas Carol movie with Alastair Sim” with the intent of screening it for my girlfriend’s mother, who insisted that it is the ultimate film version of the famous Charles Dickens story. I’ll be honest… it rang a bell but I didn’t recall ever having watched it before. I ordered a copy of the two disc special edition from the New York Public Library. I didn’t expect it to come in time for Christmas but to my surprise it arrived to my local branch within a couple of days and I ended up having to renew it to ensure we had it for Christmas.Unlike many of the classic films that the library carries on DVD, this special edition played beautifully and only had minor scratches. Apparently not too many people in New York are clamoring to watch the film. The screening this past Christmas was a profound experience for me, not because I hadn’t seen it before (it turns out I had, on several occasions as a young child) but because it brought back a vivid and important memory I have from my childhood, as it relates to my appreciation of film. One Christmas season growing up in Maine, two girls from my hometown came over (for what reason I do not remember) and these were sisters who had no television in their home. I remember them sitting down while our respective parents engaged in whatever business it was that they were there to do and I was taken aback by how enthralled these two girls were with the film that was on TV at that moment: A Christmas Carol. 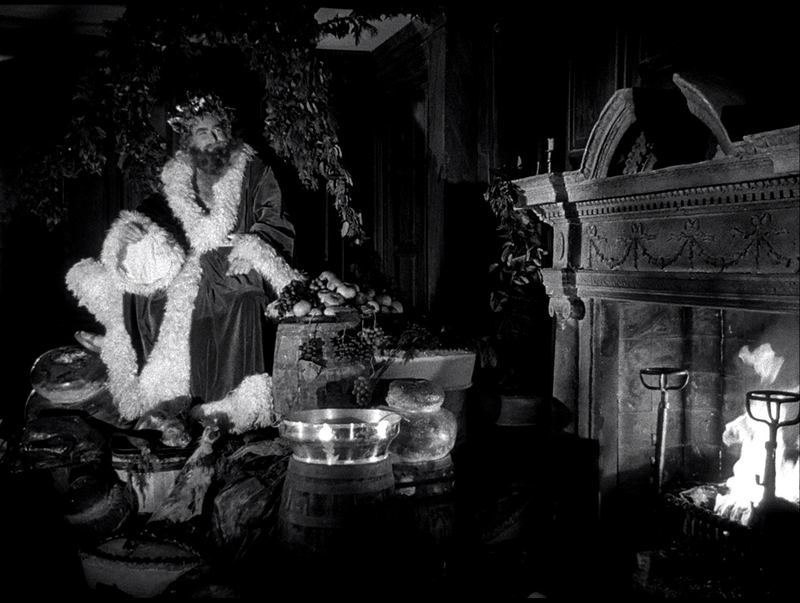 I remember the shot of the Ghost of Christmas Present sitting on his throne next to Scrooge’s fireplace. At that point in my life I was too young to have a full appreciation for old black and white movies yet these two girls (one of whom was younger than me and the other about my age) were taken by it. They couldn’t take their eyes of the television screen and they ended up staying longer than their parents’ visit just so they could finish the movie. This was the first time I realized that old movies could be entertaining and not just the bore I would normally write them off as. When you’re not faced with the modern material that is produced today, it’s easy to understand how the older, more slowly paced movies might seem like innovation to some people. For these two girls – watching the 1951 version of A Christmas Carol on network television was a luxury. In a strange and unforeseen way, this film changed me and the way I perceived the true reach of the medium. It opened my eyes and mind and allowed me to freely access the past without the childlike impulse to scoff, just because it’s “an old black and white movie”. That’s the beauty of the story and what it’s about, changing this old Scrooge for the better. If being a bitter miser wasn’t troublesome enough, imagine being visited from forces beyond the grave to educate you on how wrong you are. Ebenezer Scrooge is his name and we all know his story: he’s a ruthless businessman and borderline tyrant that overworks and underpays his staff. He hates Christmas and anything remotely happy. He considers it a “humbug” and looks at everyone taken by the Holiday as absolute fools. Normality comes to a sudden halt for Scrooge when he’s paid a visit by the spirit of his dead business partner, Jacob Marley. Marley informs him that he’ll be visited by three ghosts: the Ghost of Christmas Past, the Ghost of Christmas Present and the Ghost of Christmas Future. These visitations are sometimes frightening, other times they’re emotionally moving and some of the encounters are heartbreaking. Most importantly, the visitations are all designed for one sole purpose: to motivate Scrooge to change his ways before it’s too late. 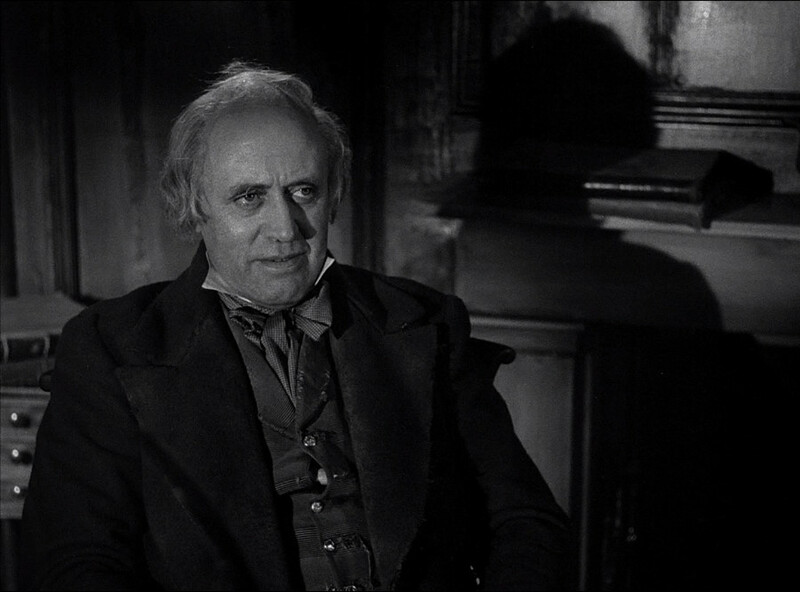 This 86 minute film stars Alastair Sim as Ebenezer Scrooge and his portrayal is considered by many critics and film historians to be the quintessential portrayal of the Charles Dickens character. Many critics agree that this adaptation is the most faithful in honoring the source material. The film was made in the summer of 1951. Noel Langley wrote the screenplay and made some important changes from the original novella, in an effort to strengthen the impact of the story and its underlying themes. Some of the most notable changes includes the expansion of Scrooge’s rise to power and eventual corruption at the teachings of his mentor, played by Jack Warner. Furthermore, Scrooge’s fiance was written to be in a position where she works with the poor and homeless, which was not in the original story. This specific backstory element has been used by later film adaptations, including the 1988 film Scrooged starring Bill Murray. Charles Dickens, the author of the original novella, had a strong social conscience which heavily underlines A Christmas Carol and all it’s layers. Langley’s impeccable script maintained and strengthened these layers at every level. There is a remarkable moment when the Ghost of Christmas Present introduces Scrooge to two children named Ignorance and Want. 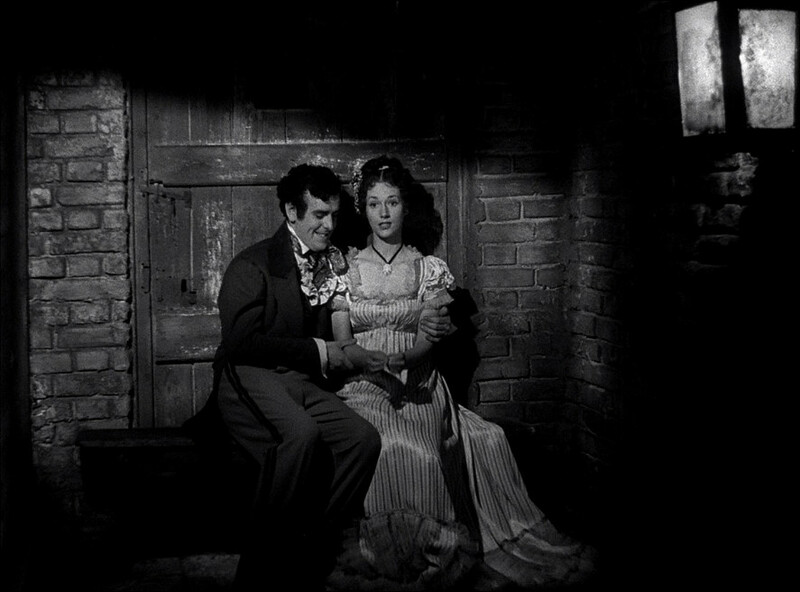 The two “street urchin” spirits seem harmless, but are actually quite dangerous and are presented as a warning to Scrooge. In the original story, this was a direct message from Dickens to Victorian society to take better care of their underprivileged children. In the era when the story was written, nearly half of London’s funerals were for children under the age of ten, all of whom came from absolute poverty. The movie was filmed in and around London with some scenes on location at the Royal Exchange but most on set at Nettlefold Studios. Actors recall the studios not having been properly sound proofed and every time they were going to roll a take, the production had to fire off a blank to scare away chirping birds. Often times this would cause nearby dogs to bark and the effort would be all for naught. Many words and phrases that are normal to the Queen’s English were changed to cater to American audiences and some of the actors had to alter their accents. 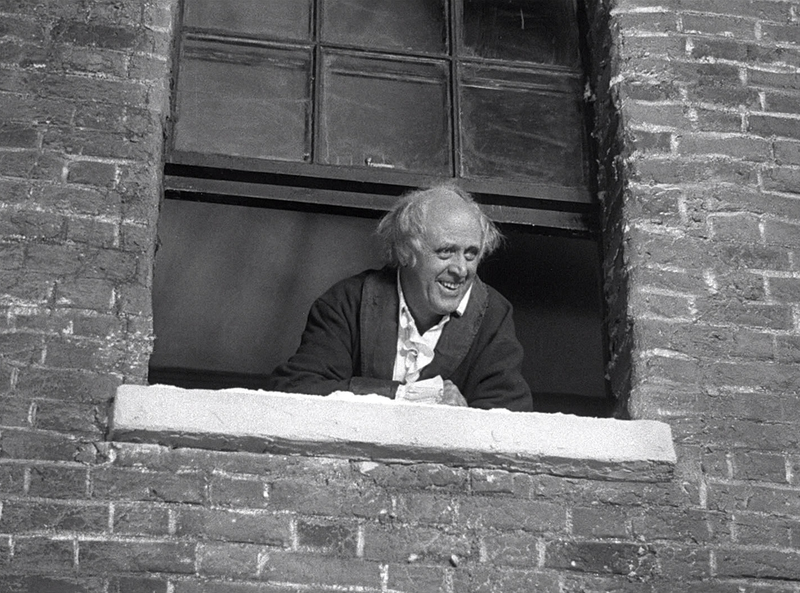 “Get out or do something about your vowel sounds” was something often heard by actor George Cole, who played Young Scrooge in the Ghost of Christmas Past sequences. Cole initially had a thick Cockney accent. 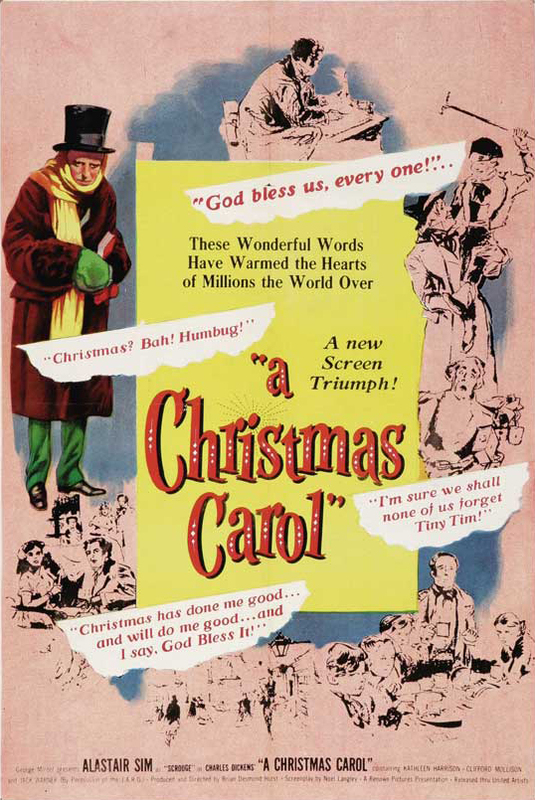 The film was first released in the United Kingdom under the title, Scrooge and in the United States as A Christmas Carol. In the US the movie premiered on Halloween at the Guild Theatre after being booted from Radio City Music Hall for being too “dark”. It was received with mixed reviews, receiving acclaim from the New York Times but largely negative reviews from less reputable media outlets. While it didn’t perform to expectations at the US box office, in the UK it was one of the most successful films through the following year. It took several years for the movie to separate itself from the shadow of the 1938 adaptation starring Reginald Owen but when it was finally recognized as a work of its own merit, it was quickly adopted as a holiday favorite by millions. A Christmas Carol has since become a classic cinematic masterpiece and a must see for any movie buff. As a result of the screening I hosted this past Christmas, I have obtained a copy of the film for my own collection and have made it a point to know the film a little more. Next Post Is there a future for 3D in cinema? I’m so glad you have appreciated the film anew. It is sublime. I added the Youtube as a Christmas post and shall now add this article as a ‘related link’. Without doubt the best version of the story ever filmed, and puts all the others in the shade. Great B+W photography, and Sim’s finest performance, in the lead role. Great review of a forgotten classic Eric. My favorite version– which I watch every Christmas. Did you notice the part after Scrooge awakens from his “trips” and looks into his one mirror? You can see that the editors forgot to hide the cameraman, whose reflection and movement are clearly in the mirror. Still, even Dickens would have been proud of that studio’s efforts and final result. I came across this movie by accident, oh, around 2004 and it really became a part of my families Christmas life. We’ve made it a tradition to watch it every Christmas Eve. I just got it on Bluray !